As a recruiter, I understand how insanely hectic your priority list can be. Let’s face it, a good recruiter is working multiple different jobs for several different companies on any given day and speed is of the essence. 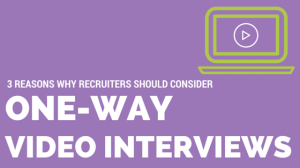 In order to work quickly, efficiently, and accurately, you should consider implementing one-way video interviews into your candidate screening process. As with any job search, we are faced with numerous candidates to screen and weed through. Typically, we pick through resumes and start dialing, leaving voicemails, scheduling initial phone screens when candidates are not immediately available, and spending time on the phone with candidates who just aren’t qualified in spite of their awesome resumes. You can save time with one-way video interviews by screening the candidates before you spend all that time smiling and dialing. After you have weeded through and selected the most qualified candidates based on their resume, rather than spending time dialing and leaving voice messages, send the candidates a request to complete a one-way video interview. In a one-way video interview, you will list several questions that the candidates will read and then respond to via video. The candidates will decide when they are comfortable with their video before submitting. When you receive the submitted video interview, you are able to review when you have time and replay if needed. This allows you to quickly get the key skill questions to the selected candidates and receive answers without the off topic chit chat, interruptions, or numerous phone call attempts. Many people think that a candidate’s skill set should be discerned via the resume. As a recruiter, I know that is not always the case. Many resumes list skills that candidates are not able to speak to, simply due to exaggeration. By using the one-way video interviewing tool, you will be able to quickly understand if the candidate has the skills required for the job before spending any more time in the interview process. This will not eliminate all non-skilled candidates, but it will eliminate a huge chunk of them, saving you tons of time. Cultural fit is a popular topic today. With so many startup companies and companies with specific targeted environments, many hiring managers are looking for not only top talent, but top talent that will fit into their company culture. Cultural fit is a very difficult thing to discern in the initial phone screens. By using the one-way video interview in your process, you will be able to better understand the candidate’s personality. You’d be surprised at how much more a candidate’s personality shines through via video versus over the phone. 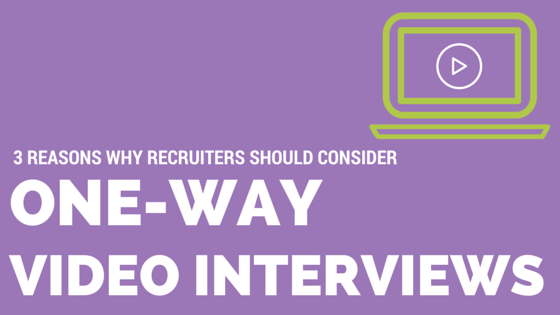 Have you integrated the one-way interview tool into your recruiting process? Please share your experiences below.